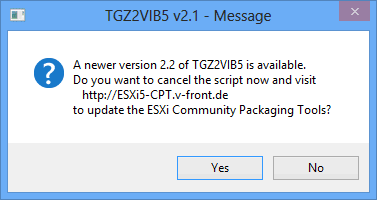 I have published updated versions of my ESXi5 Community Packaging Tools. Community developers who create drivers and applications for ESXi 5.x can use these tools to package their software into the official distribution formats VIB and ZIP (Offline bundle). Easy-to-use GUIs help them to enter the package's metadata without the need to manually edit text files.